Although the mother's pouch has expanded greatly since the tiny newborn wombat first entered it, there is a limit to this expansion and to the extra weight the mother can carry around. The muscle around the pouch opening, which has supported and held the large young, can no longer close the opening completely. Because the pouch has expanded more towards the anterior, its opening now faces towards the mother's tail. Hence the pouch of the wombat is often described as 'backward-pointing', although this is only true when the large young is inside. Figure 6.5 By 10 months of age the young has permanently left the pouch and is eating grass as well as drinking from the mother's elongated teat. but it still also suckles from the elongated teat and may continue to do so until it is about 15 months old (Figure 6.5). During this period when the young is gradually drinking less and less milk and eating more and more grass and other plants, the bacteria necessary for the digestion of plant material in the animal's colon become established. How the young wombat obtains these micro-organisms has not been recorded. Young koalas, at weaning, eat the mother's soft faeces, which contain semi-digested material and bacteria from the mother's caecum. Hand-reared wombats, if given access to scats from an adult wombat, will readily eat them from time to time. One wombat I hand-reared ate fresh scats dropped near the house by a semi-tame adult male on six separate occasions during the four months prior to weaning. Occasionally, when she first began to eat grass in some quantity, this young wombat would turn and eat the scats that she herself had just deposited. It seems likely that, in the wild, a wombat eats its mother's scats in order to acquire its digestive bacteria. Little is known about the young wombat's life during these months before weaning, but it seems likely that during this very vulnerable time in its life it spends much of its time in or very near a burrow, and it is almost always at its mother's heels when she moves about. A mother with a small young at heel, probably about 11 months of age, was consistently found every night for a fortnight within 30 metres of an isolated burrow in the forest. She appeared to be feeding in close proximity to the burrow for two to three hours and spending the rest of the time in the burrow. A month later she was still feeding only 50 metres or so from the same burrow. 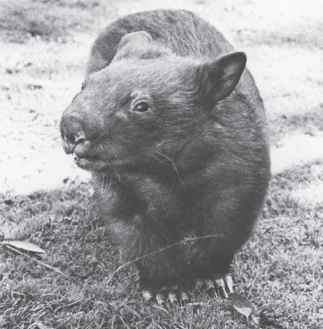 The young wombat seemed to be very familiar with this restricted area; and if alarmed by a sudden sound, such as a falling branch or a squall of wind, it would bolt back to the burrow independently of its mother, which stolidly continued grazing, merely lifting her head to listen to her offspring's panic flight. 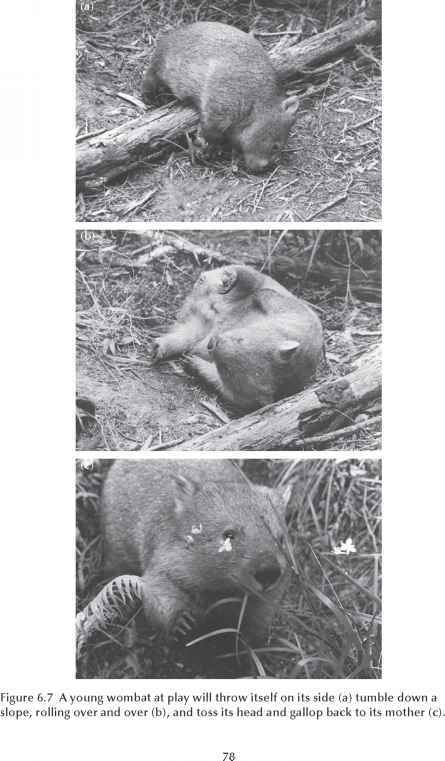 Figure 6.6 A young wombat giving the soft 'huh huh' contact call. sharp, high-pitched cough. Immediately the mother came charging through the ferns towards us, but I did not stay to see how she would react to my presence, as I have no doubt that she would have been fiercely protective if she felt I had threatened her offspring. A wombat mother, like those of most other mammal species, is unusually bold and will confront any enemy that poses a threat to her as well as to her young. A potential predator needs to be very fast indeed if it is to seize and carry off a young wombat before being attacked by its angry parent. Foxes probably take small young at heel, but feral dogs and dingoes pose the chief threat to young wombats. During this very vulnerable time of its life, the young is always alert and much more ready than its mother to run for cover if a strange sound disturbs it. 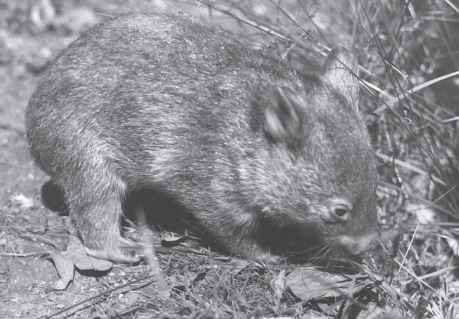 Its vulnerability may be one of the reasons why a young wombat will secretively deposit its scats in undergrowth, rather than displaying them as an adult does, as during the few moments it is defecating it is practically defenceless. too, as it gradually becomes more familiar with the area in the vicinity of the burrow, its confidence increases, and so does its playfulness. It will often intersperse its feeding and exploring with bursts of vigorous play. Wombat play is made up of several characteristic movements and attitudes performed in no particular order but with tremendous enthusiasm and exuberance. Typically, a young wombat signals the beginning of playtime by standing absolutely still with its front legs stiff and straight. Then it jerks its head and shoulders up, sometimes lifting its front feet right off the ground. Then, but not necessarily in this order, it tosses its head from side to side; jumps in the air with all four feet off the ground; rolls over on to its side; races off at a rocking gallop before coming to a sudden stop, reversing through 180 degrees on the spot and racing back to its mother, stopping or veering sideways just before the expected collision; lies flat on its stomach, head thrown back and swinging from side to side, lips drawn back in a wombat 'grin'. If it is playing on or near a slope, it will sometimes run up the slope and roll down, tumbling over and over on its side (Figure 6.7). I defy anyone to watch a wombat at play without laughing aloud. As the young at heel explores the world beyond the burrow, it takes every opportunity it can to have some digging practice. 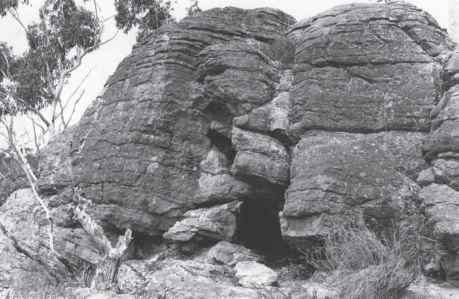 Any hole or depression in the ground where earth is exposed will be investigated: stump holes where trees have fallen or burnt, rabbit holes, hollow logs and, most favoured of all, small minor burrows begun by other wombats but disused for some reason. Employing all the motions that it will later use in more serious excavations, the young wombat will dig enthusiastically, emerging occasionally to check on the whereabouts of its mother. Its long sharp claws gradually become shorter and blunter.